The small Buddhist Kingdom of Bhutan lies along the ridges of the eastern Himalayas, bordering the global giants of Tibet and India. Most of the country is mountainous, with some of the highest unclimbed Himalayan peaks on earth. It was these mighty Himalayas which protected Bhutan from the rest of the world and left the kingdom blissfully untouched. 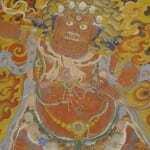 Bhutan’s history is steeped in folklore and mythology and the country still retains all the charm of the old world. It was only in 1974 that it opened for tourism, and travellers today experience the full glory of this ancient land through its strategic fortresses (dzongs), numerous ancient temples, monasteries and stupas which dot the countryside, prayer flags fluttering on hillsides, lush forests, rushing glacial rivers and the warm smiles and genuine friendliness of the people. 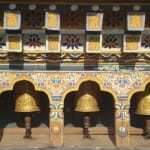 Start planning your Bhutan holiday by getting in touch with one of our travel experts. 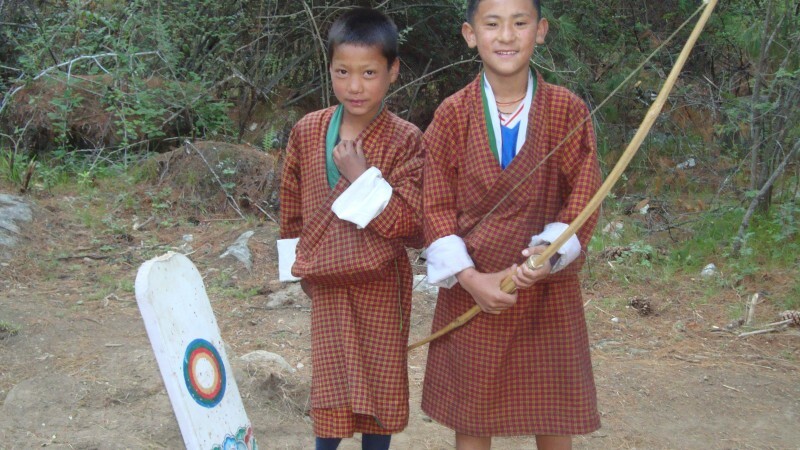 Archery is not only the national sport, but it is also a bit of an obsession in Bhutan. It is very much part of their cultural identity and one of the few sports in which the country participates at an Olympic level. There are tournaments held throughout the country and so you may well be able to see one when travelling around Bhutan. However if you want to get a little more ‘hands on’ then how about having an archery lesson which we can arrange with some of the hotels and having a shoot off with a local which always leads to endless laughter and entertainment for all and a wonderful way to interact with the people. 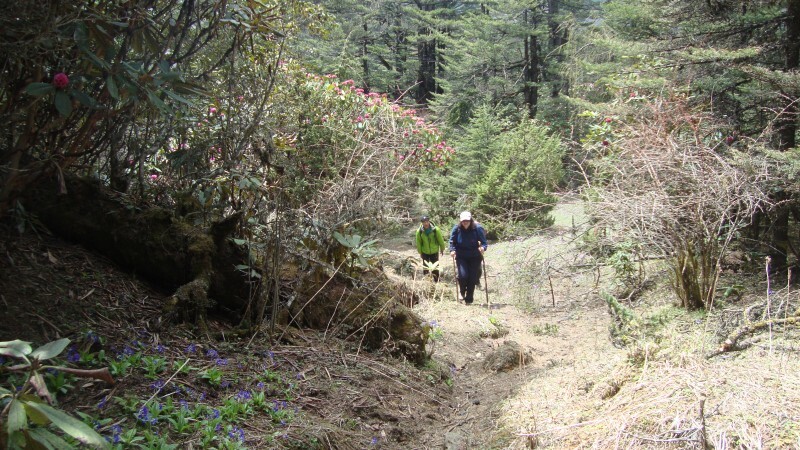 As with other countries in the Himalayas, there are many wonderful treks to enjoy ranging from short day hikes to week long and even month long treks for those with time and stamina!. Bhutan is a wonderfully photogenic country and these treks will take you on a journey through a huge variety of amazing scenery, including rolling hills, snow-capped mountains, rhododendron forests, terraced paddy fields and highland Yak grazing pastures. Treks are typically supported by a full trekking team including your guide as well as a cook and pony team who carry the luggage, put up your tents and serve up delicious meals throughout the day. The tents are comfortable, but not luxurious, the food is good especially when you consider how remote you are and the quality of guiding is wonderful. In some areas it is also possible to stay at local farmhouses with the local people, which is a fun experience, but arguably more basic and rustic than camping. Please do contact us and we can tailor a trek to suit your requirements and time schedule. The best times to visit to Bhutan are either the Spring months of March to May when you get clear blue skies and warm days with clouds building up in the afternoons and all the Spring flowers are in bloom or alternatively the Autumn months from late September to November, when the skies are very clear after the summer monsoon and the days are a perfect temperature for exploring and trekking. The winter months from December to February can be dry but potentially very cold there could be plenty of snow on some treks. The summer months from June to August are typically very wet, hot and humid and not a great time to visit. 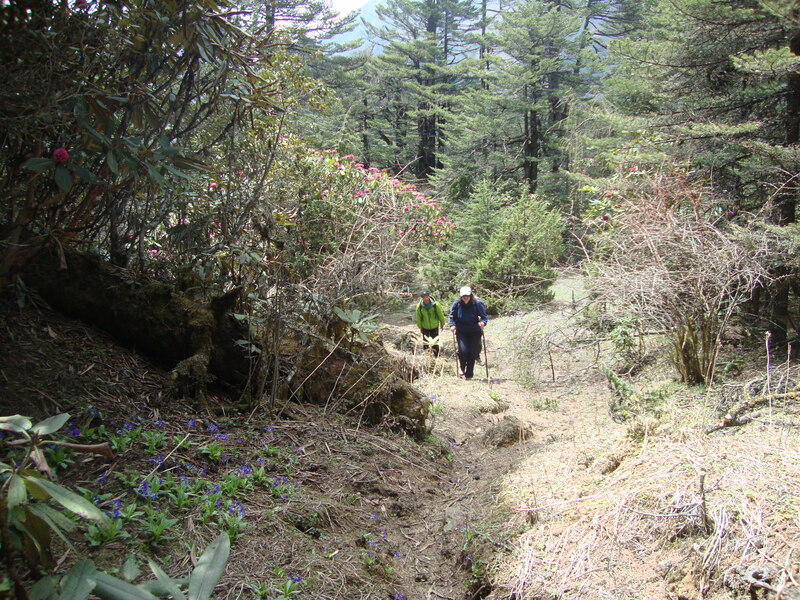 The scope for trekking in Bhutan is immense, from short walks to arduous treks. The short 5 day trek below leads from Paro to Thimphu or vice versa, crossing the chain of mountains that separates the two valleys. Although the route is sparsely inhabited, there are wonderful lakes teeming with fish and the area is famous for its spectacular rhododendron forests, which bloom in May. In the clear weather of late autumn and winter there are great views of the Himalayas. This trek is usually possible from late February to June and from September to December. (Price based on two people sharing a twin/double room excluding the cost of international flights London/Delhi/Paro/Dheli/London and excluding hotel in Delhi/Kathmandu on first and last night). "We felt superbly looked after by all the staff on the boat and the chef just got it all right - portions, variety, spiciness and a wonderful touch to be introduced to each dish with such pride. Mansoor was knowledgeable, polite and accommodating. He engineered all the trips, entertainment etc very well, anticipating our interests and needs. The camp facilities were great and what a spot! I felt wonderfully looked after the entire trip and importantly felt safe. There were smiling, welcoming faces wherever we went. Particularly outstanding was the lunch we had in the family home on our day trip out from Lake Dal. My many thanks go to the whole team." "Our trip was just fantastic, and we could not have enjoyed it more. Everything worked like clockwork and the organisation was first-class. We packed a lot in but the comfort of the road transport meant that the journeys in between were more relaxing than trying. The stand-out part of the whole trip was Chhatra Sagar... It was altogether a brilliant holiday. We are so grateful to you for all your expertise and organisation, and we arrived back home (freezing temperatures and run out of heating oil!) thinking where we should go next (once we have replenished the coffers…) With our best wishes, and our thanks again". "Things have slightly calmed down since my return from India and I thought I must write to say thank you for the wonderful experience of Kerala. 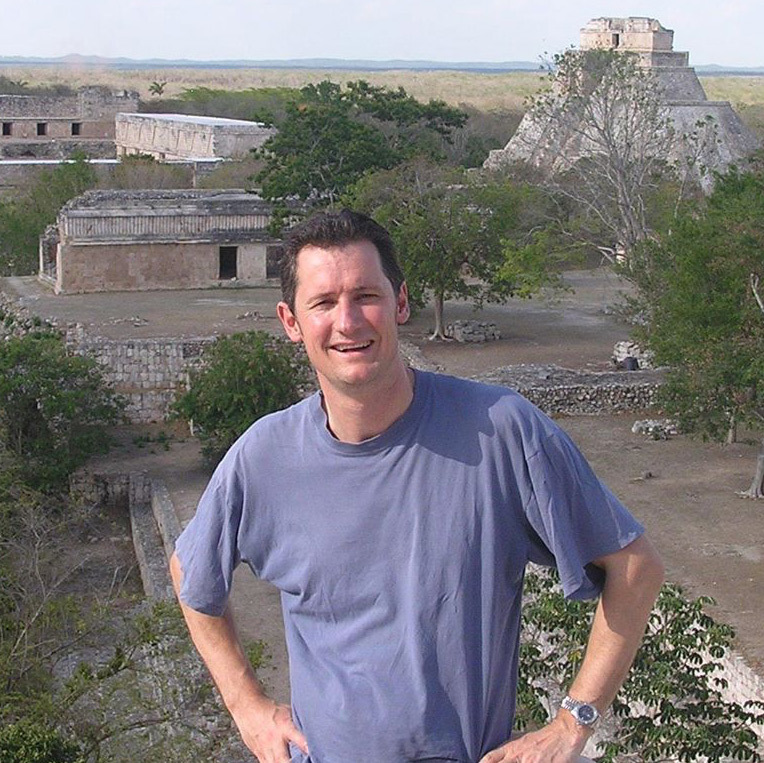 I am much richer for the experience and think about all the things we did often. It is all thanks to you that I can add Kerala to my memory bank".